For now though, I've found 10 things all for £10 or less that I think would make great gifts for the men in your life! I've left out very obvious gifts like chocolates, socks, underwear etc, because I wanted to pick out some bargains that you would perhaps think were worth more than just £10. This is perfect if you want to really treat someone with lots of presents without spending a fortune, or if you're on a very strict budget, but still want to get a substantial present. If the men in your lives are anything like my fiancé Darren, they're probably still big kids at Christmas time. 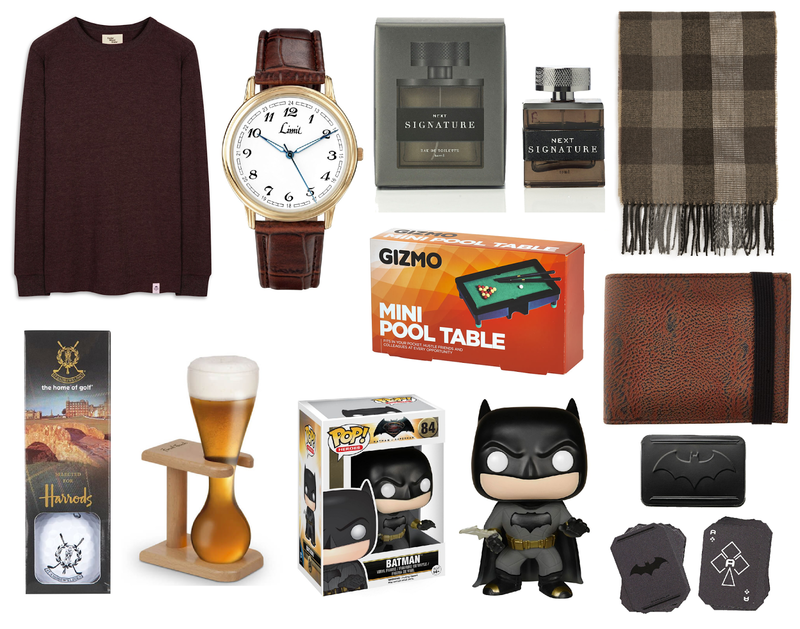 So, I threw in a few silly and fun gifts such as the Pop Vinyl figure, Mini Pool Table and Batman playing cards. While they are a bit silly, gifts like these are a lovely little extra, as everyone loves to feel like a kid at Christmas! Primark are on point with their collections this year and I think the menswear in particular is just fab. The jumper above is only £8 and the scarf just £3, so they couldn't be more perfect for a purse friendly pressie! More accessories, the watch and wallet are both super inexpensive too and I think they've both got an almost retro, vintage look which seems to be pretty in this year. Many high street shops do their own branded fragrances and one of my favourite places to get them is definitely Next. the quality is incredible for such low prices and I think they look particularly attractive too. Again, another perfect stocking filler that feels a little bit luxurious! Speaking of luxury, anything from Harrods is always going to feel that bit more special, so I thought for any golfers out there, the set of Golf balls from Harrods add a little bit of luxury to an otherwise fairly predictable present!! So, that's it! What do you think of my picks? Will you be doing a Christmas stocking for anyone this year? Let me know where your favourite place is for bargain gifts!